The Multicultural Center at the University of Oregon recently held a screening of the documentary, The Return of Navajo Boy. The director, Jeff Spitz, spoke beforehand. He told about how in the late 1990’s a man named Bill Kennedy approached him with a film that his recently deceased father had made in the 1950’s. 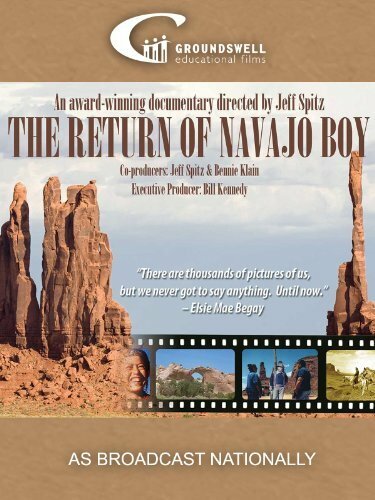 It was a half-hour documentary about the Navajos (Diné) called Navajo Boy. Kennedy asked Spitz to help him preserve his father’s work. Spitz could make no sense out of the film, which had no sound. He took the film to a library in Chicago that had an extensive collection of literature and films related to Native Americans. The people at the library told him that the film showed a ceremony that, according to Navajo religious belief, should never be filmed. They advised him to destroy the movie. Spitz couldn’t bring himself to do this. Instead, he and Kennedy decided to locate the people in the film and ask them what should be done with it. The documentary begins with Kennedy talking with Lorenzo Begay, a descendent of the family in the film. (We’re not told how Kennedy managed to locate him.) He lives with his family on a reservation in the austerely beautiful Monument Valley in Utah. 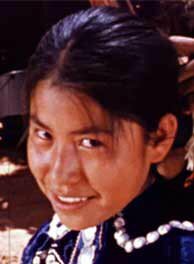 He takes Kennedy to meet his uncle and his mother, Elsie Mae Cly Begay, both of whom appear as children in the film. Elsie Mae Cly Begay in the 1950’s. He shows the movie to the Begay family. They seem pleased to see themselves in it. We are then told about the family’s history. During the 1950’s, they supported themselves by raising sheep, which they still do today. They were also paid by a local merchant to pose for photographs that would be used for postcards. (They also appeared as extras in John Ford’s The Searchers). Elsie Mae’s mother, Happy Cly, was believed to be the most photographed woman in America at that time. Some members of the family also worked in the uranium mines. The Navajo workers were not warned about the health hazards of radiation exposure. One of Elsie Mae’s brothers worked in the mines, and he later developed cancer. The film discusses his efforts to get compensation from the government. Also, radioactive tailings from these minds contaminated the ground water. Elsie Mae’s hogan was built using rocks from the mines. Later it was found to contain 80 times the acceptable level of radiation, so it was destroyed. Two of Elsie Mae’s sons died of cancer, and a third has recently developed it. Happy Cly died from cancer. It turns out that the ceremony shown in the documentary by Bill Kennedy’s father is that of a medicine man trying to cure her. Elsie Mae had a baby brother, John Wayne Cly, who also appears in Kennedy’s movie. When Happy Cly died, the family was unable to take care of him, so they gave him to white missionaries who promised to bring him back when he was older. They never did. When Kennedy’s documentary is shown at a Navajo museum, John Cly, who was then living in New Mexico, reads about it in a newspaper. The film ends with an emotional reunion between him and his family. 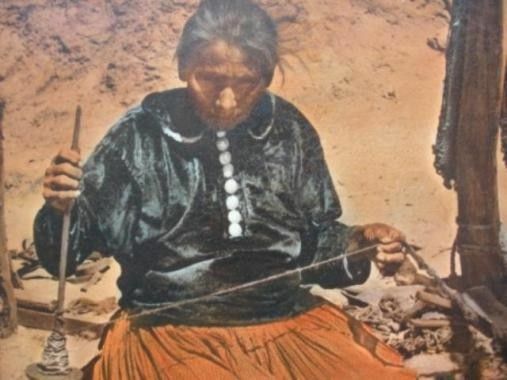 There is also a postscript that relates how Elsie Mae now travels the country and to other countries to tell people about what uranium mining did to the Navajo nation. This is an interesting and important film. Incredibly, the government wants to reopen some of these mines to provide fuel for a new generation of nuclear reactors. This is more evidence that nuclear energy is a bad idea. You can learn more about this film at NavajoBoy.com. This entry was posted on October 11, 2011 at 6:23 am and is filed under Cinema, Environment, Health, Imperialism, Native Americans, Nuclear Energy, Popular Culture, Racism, Uranium Mining. You can follow any responses to this entry through the RSS 2.0 feed. You can leave a response, or trackback from your own site.